Open configuration means: no hidden rules or dependencies. User can inspect and modify every bit of Jetico Personal Firewall configuration. In conjunction with rule based filters it gives the user unpreceded control over network related events. 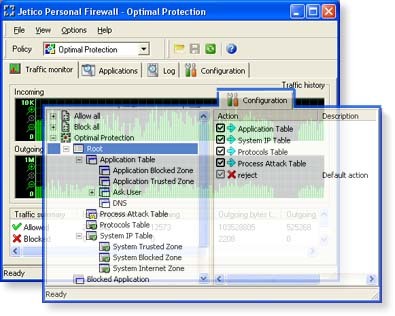 Fine grained logging and statistics simplify both network events and firewall configuration analysis. The unique live statistics display which firewall rules are applied in the realtime.